Freeze/thaw will eventually destroy almost any porous material, as will salt exfoliation. If it never takes up water and thaws this might not be an issue. I'm again "late to the party," on this discussion. Making bricks that are strong and impervious to moisture infiltration can be accomplished through the nascent Mars chemical industry by use of a mixture of resin monomers as the "glue" to hold regolith together. I've harped on this method of brick making before. Using Robert's list of plastic monomers available by ISRU, we can come up with a regolith-polymer blend something similar to an ABS plastic as the matrix for the regolith. Since Mars has a 0.38 g gravity, we can make these "bricks" a lot bigger and use an epoxy-type "mortar." I'd suggest at least a 16" wall thickness made from bricks dimensionally 12" x 16" x 24". Even with Mar's lower gravity, these will be heavy. Any structure will be structurally robust and stable. In order to make these capable of being easily handled, I suggest they be made in a manner similar to concrete blocks and having voids in them to save on materials and subsequently reduce their weight. These should be impermeable to gasses and any moisture. If structures are built from them, they should be double-walled, and the space between walls filled with a foamed in-place polystyrene foam as insulation. Why not mix it up like a cement and pour it into a form that can be gently heated to make the brick materials cure. So what will we have early on to create forms from? One solution is to use the cargo lander shell materials if we have torches to cut it from the frame of the unit to fashion them into what we desire. That's precisely the way these would be made; a small system could be brought from Earth to make these. The initiator is called AIBN (azo-bis-isobutyronitrile). It's a very effective free radical generator and polymerization initiator. It initiates polymerization at 65 degrees C. A cure time is probably going to be 12 hours from start to finish. The mould needs to be heated for maybe half that time to initiate the reaction, then the final cure in a 70 degree C oven. Styrene has a large exotherm on polymer initiation, so keeping the styrene content fairly low would be advised. This would be a great experiment for the Desert Research Station! If you are casting in a form, why not use a dome segment form rather than bricks? Add some fibre (basalt?) for tensile strength. In a dome shaped structure, every course of the bricks would require a different shape and size. I'm using the KISS principles. Simple is better for the early settlers. Basalt can be very useful e.g. for lining and supporting walls, floors and trenches. There is no shortage of basalt on Mars. But what is the equipment energy, mass of it to just get it to a site for processing with what is that equipment plus energy needs, what are the other support equipment ect.....when we look at these we now know that we are going to need to wait for a means to not only deliver the mass but the energy requirement of an end to end solution which for Louis is the BFR train of cargo landers. So the question would sub scale production since we are not building a city just a small building at a time to which we can keep building on as a toehold is now a foothold and so on with each present state mission design. Also there are now robots that can weed. Brickmaker and ceramics artist Josh Copus demonstrates the handmade brick making process. The Brick Factory has moved to different neighborhoods in Baltimore where the public have been leaving their marks for history, stamping their stories of place, words of wisdom and art onto bricks in conjunction with the Imagining Home exhibit with BMA resident artist Marian Glebes. The bricks will eventually be part of a public art sculpture, installation or walkway. Oldfart. In a hemispherical dome all 5degree square bricks would be the same All ten degree square bricks would also be the same. They just wouldn't have sides mutually at a right angle. Since small bricks leak why not do a dual wall with the sealing with the mix of AIBN as Oldfart like motar between the layers and then as concrete wall as indicate would work as a means to pour the sealing wall in between the bricks to make a thick wall for the internal pressure. Much like the new replication topic we are running into what to do with mars insitu processing. Of course a glass greenhouse was brought up. During the next few years, Iron Ox wants to open robot farms near metropolitan areas across the U.S. to serve up fresher produce to restaurants and supermarkets. Most of the vegetables and fruit consumed in the U.S. is grown in California, Arizona, Mexico and other nations. That means many people in U.S. cities are eating lettuce that’s nearly a week old by the time it’s delivered. 3D printing will make bricks totally obsolete. Early in Mars developement I got a feeling that automation will not be all that high until there are either delivered energy sources or insitu built plants that are greater and more continuous than solar can provide. 3D machines will require much more insitu materials processing equipment to get them started to pay some value after the amount of materials sent with them are exhausted. 3D printing is not that good for speed or quantity. I like the compressed brick idea. Energy to produce the compression is not a problem. No need to bake. You should be able to produce thousands of bricks per sol with a relatively small amount of machinery that would be nearly 100% automated. Louis-We will not need weeders if we carefully screen all seeds and avoid bringing any weeds along. This is a rebirth of agriculture on a new planet. No flies, no mosquitos, no aphids. Well. That's an interesting assertion. It's like saying an e-mail will never have the speed or quantity of a Fax. We talked about Helostat units on page 2 and how concentration is part of the key to energy and light power. Now we can have hot water and power from this action. MIT engineers have built a device that soaks up enough heat from the sun to boil water and produce "superheated" steam hotter than 100 degrees Celsius, without any expensive optics. On a sunny day, the structure can passively pump out steam hot enough to sterilize medical equipment, as well as to use in cooking and cleaning. The steam may also supply heat to industrial processes, or it could be collected and condensed to produce desalinated, distilled drinking water. 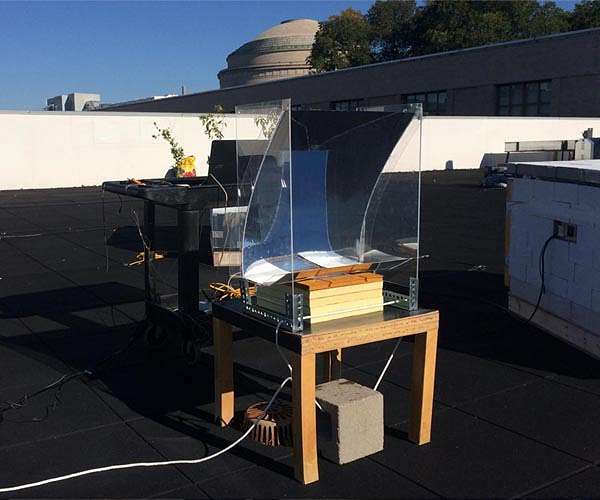 They found that the structure was able to heat a small basin of water to the boiling point and produce superheated steam, at 122 C, under conditions that simulated the sunlight produced on a clear, sunny day. When the researchers increased this solar intensity by 1.7 times, they found the device produced even hotter steam, at 144 C.
With this added shielding, the structure produced steam in excess of 146 C over the course of 3.5 hours. In subsequent experiments, the team was able to produce steam from sea water, without contaminating the surface of the device with salt crystals. In another set of experiments, they were also able to collect and condense the steam in a flask to produce pure, distilled water. Lots of good stuff, showing up. I think a person needs to be careful to not remain flexible to adapt to new technologies. The research described in this article apparently is intended to discover the effect of variations in gravity on plant seeds. This a local activity, so if there is interest I would be willing to visit Dr. Wolverton. It will take some time for results to become available. Another link NASA is expanding its 'Veggie' space program OU plant-gravity experiment now aboard International Space exploring how gravity affects the growth of plants. The experiment uses mustard seeds, which are widely used as a model organism in plant biology. They have a rapid life cycle and are prolific seed producers. To do its job, Sweeper uses a camera that can recognize the color of a pepper. Computer vision then helps the robot decide if the fruit is ripe for picking. If it is, Sweeper uses a small razor to cut the stem before catching the fruit in its "claws" and dropping it into a collection basket below. To pick a single pepper takes about 24 seconds, though the researchers say they purposefully slowed down the robot's movements for safety reasons. Sweeper is also equipped with LED lights so that it can work regardless of the time of day, for about 20 hours/day. Still, the robot is far from perfect, with only 61 percent accuracy in picking ripe fruit. Sweeper is not the only harvesting robot out there. 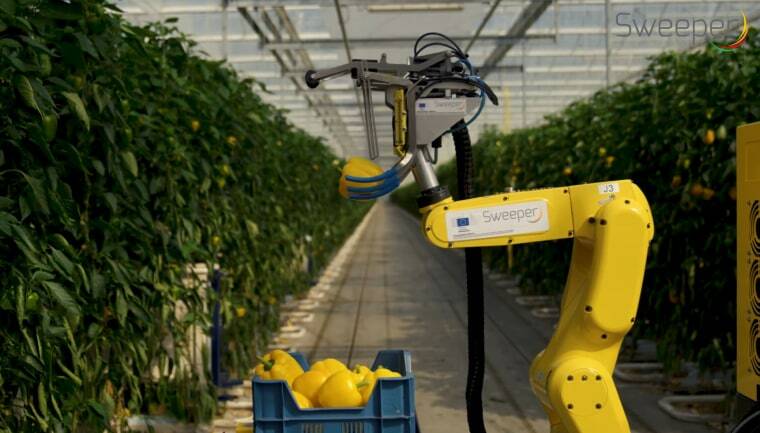 Argobot is testing a machine that picks strawberries, Green Robot Machinery has a cotton-picking robot and Israeli start-up MetroMotion is working on a tomato-picking bot. According to Market Research Engine, the agricultural robots market is expected to reach $75 billion by 2025.